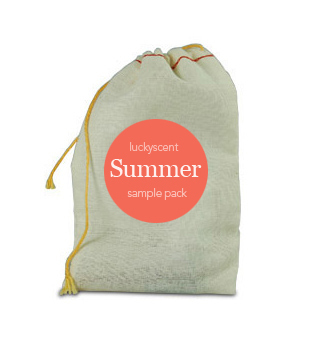 Last week the LuckyScent Summer Sample Collection arrived so I thought I would trot out 4 of the 10 new scents involved and give you the usual 3 sentences and a star rating. I figured you all liked this so much last week that we’d look at another 4 this week, cool? Follow the jump to find our Rating System Page (<<jump). This week I was so lucky to get a bottle of bandit !!! A sales assistant had a full tester aside, it’s long discontinued so he said I can have it if I bought another Robert Piguit . I bought Cravash ! It’s nice to , similar to Eau savauge with better staying power ! The real star is bandit !!! Herbal , bitter , smoky and mouth watering leather ! Woohoo Portia . Slap me silly . Have u tried it ? Also Femme Rochas , I sprayed it on my clean Sunday sheets and slept in scented heaven last night !!! I bet your sheets smelled AH MAY ZING!!! Oh boy, the PEONEVE by PENHALIGON’S 2012 sounds really nice. Why yes I did try something this week. Tea Rose by The Perfumers Workshop LTD. which smells just like girls I knew in the discos in the 1970’s! And the very unique Femme which was recommended by some beauty I know in Sydney. I love it and am looking to find my key to a review on it. Then I tried Worth for Men which is cheap but interesting. Finally the DREADFUL Robert Piguet’s Fracas for Men. Oh my bloody stars it is like smelling Freon mixed with sewage from Tijuana that has been fermenting in an old cooler for about six weeks. I have passed homeless men on the street that smell better than this travesty. I did a little research and there is a reason behind why it smells so bad. HA HA I LOVE Bandit for Man. Are you doing a post? I did one a while ago, HA HA HA> I am laughing that you hate it so much. HA HA HA> There was a less friendly one a couple of weeks ago. I enjoy a lot of them but do not desire them, as you can see in the star ratings. HAH! I’ll try some stuff I hate for you next week.